Snow is coming. You can smell it in the air. This morning I stepped out into my driveway to find a thin frost over everything. It feels sterile and unwelcoming. It is also a harbinger of much time to be spent in a car. Enough lamentation -- I'm not off the road yet, even if my fingers do tingle and burn as they warm up again after each ride. 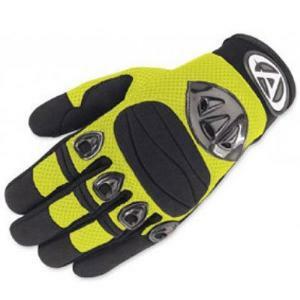 While AGV's Cool Tex gloves are not designed for winter weather, they do provide a surprisingly thick layer that can insulate your pick-up sticks against the burgeoning bitterness in the air. On the other hand, actually on both hands, there are big vents that cool across the knuckles and back of the hand, but like I said, they're not designed for winter. These vents, along with tough textile, make the Cool Tex excellent for cool to warm weather but not so much for cold or hot. Surprisingly lightweight, these gloves do boast armor on the knuckles and gel inserts in the palms. The gel does a good job of taking the buzz out of the ride, but they also reduce feedback and feel. To return a little of that feel, there are silicone strips on the fingertips. All in all, AGV's Cool Tex are hit and miss. They work best in moderate conditions, and AGV struck an awkward balance between protection and flexibility. You certainly would do better to look at some of the bigger names in gloves, but they are not going to give you AGV's price. The Tex costs anywhere from $12 to $35, depending on the vendor. They do have a decent look and come in red, blue, or yellow.